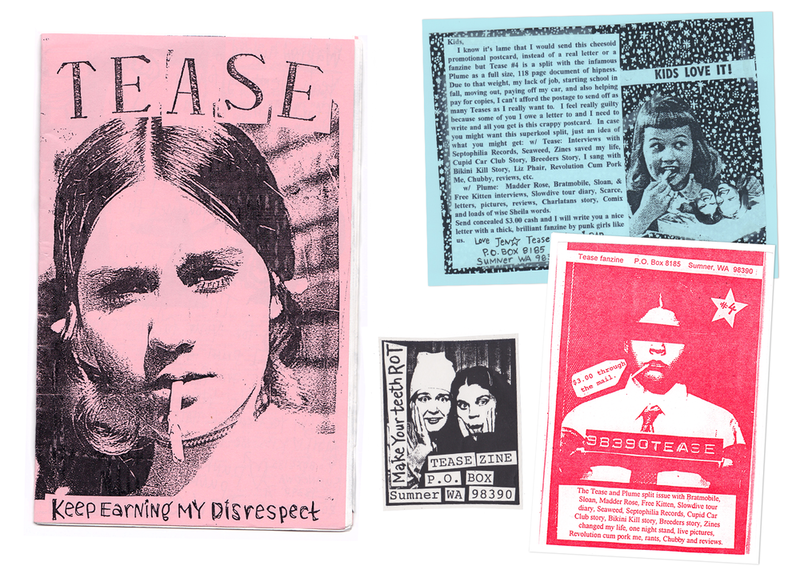 When I was 15 I started making zines and fell in love with zine culture, mail order friends, new information, punk ideals, and photocopy art. 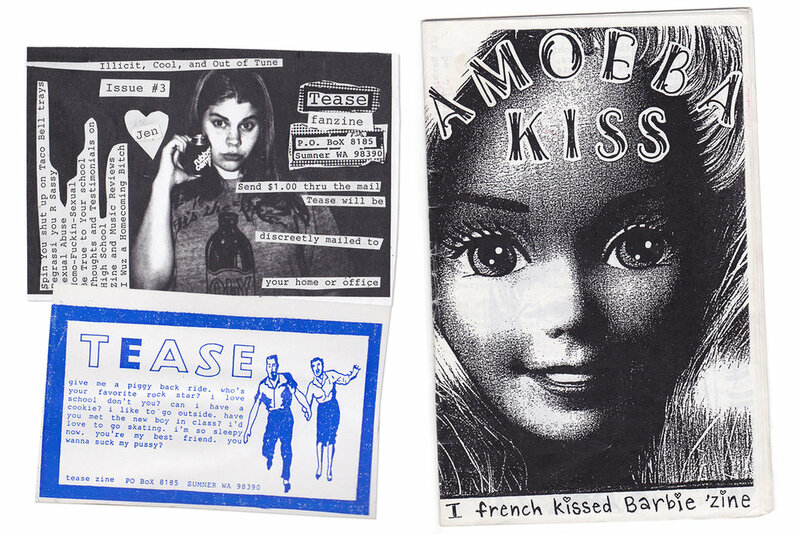 My first zine was called Amoeba Kiss. At the time, my best friend and I, budding teenage feminist agitators were fond of defacing barbies—defacing and burning their heads (and occasionally wearing the burnt heads as necklaces). As a symbol of my outrage/distrust of unfair beauty norms—Barbie images feature heavily in this first zine. Included is a spectacular diatribe on the injustice of girls being expected to shave their legs. 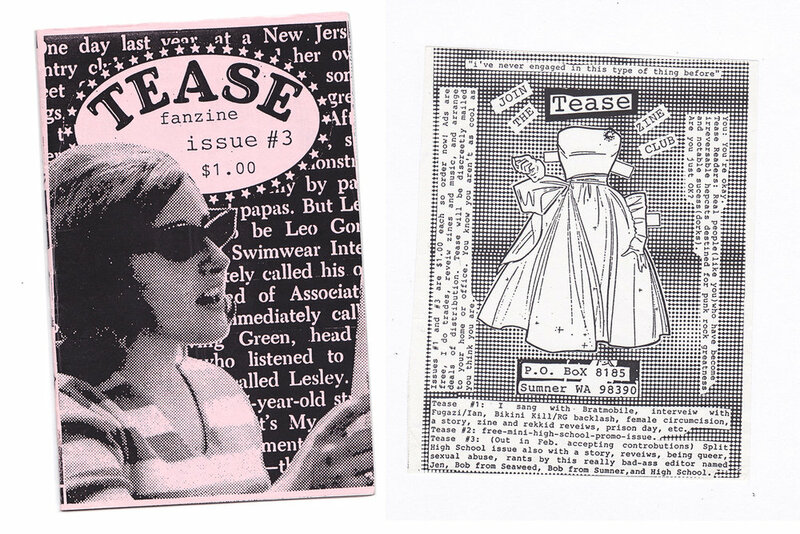 After that, I created a zine called Tease. One of my favorite things about doing a zine was making flyers / stickers / self promotion. I'd put them inside zines at the Tower Records in Tacoma (which for a while had a pretty amazing small press and zine section), or at skate shops or records stores in the surrounding area. I received correspondence from local kids I'd later meet. I felt like I was sending secret messages to other teenagers searching for content and connection. At the time I also had fantasies of making mini-zines that I'd place in lockers at area high schools, letting kids know they weren't alone, that they could resist what I felt was a high school culture that suppressed individuality, self-acceptance and honest expression. I can say without hesitation that zines saved my life. Zines introduced me to many of the ideas and interests and people that played and continue to play a huge part in my life.